Thank You to The Wesley Community’s Generous Volunteers! Group photo from the Volunteer Luncheon at Wesley’s Woodlawn Commons. 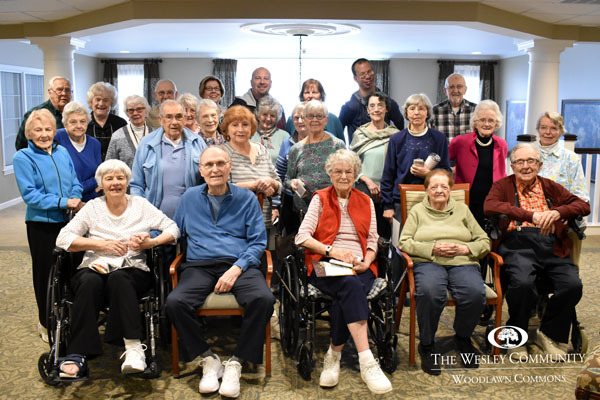 As National Volunteer week is upon us, The Wesley Community would like to thank our many volunteers, as well as share ways that you can volunteer and make a difference in our resident’s lives. Volunteers are an important part of fulfilling our mission at The Wesley Community. Volunteering here can include a variety of things that enrich our resident’s lives, such as visiting with the residents, assisting with resident activities and events, or serving in the gift shop. If you are interested in volunteering at The Wesley Community, you can find more information on our website’s Volunteer Page or email Kathy Welden-Pinney, Volunteer Director, at kawelden@thewesleycommunity.org.